An unusual belt buckle by the Parisian jeweller and glass maker René Lalique which had been worn by the vendor throughout her nursing career has sold for £19,000 at a North Yorkshire auction. Lalique belt buckle – £19,000 at Tennants. 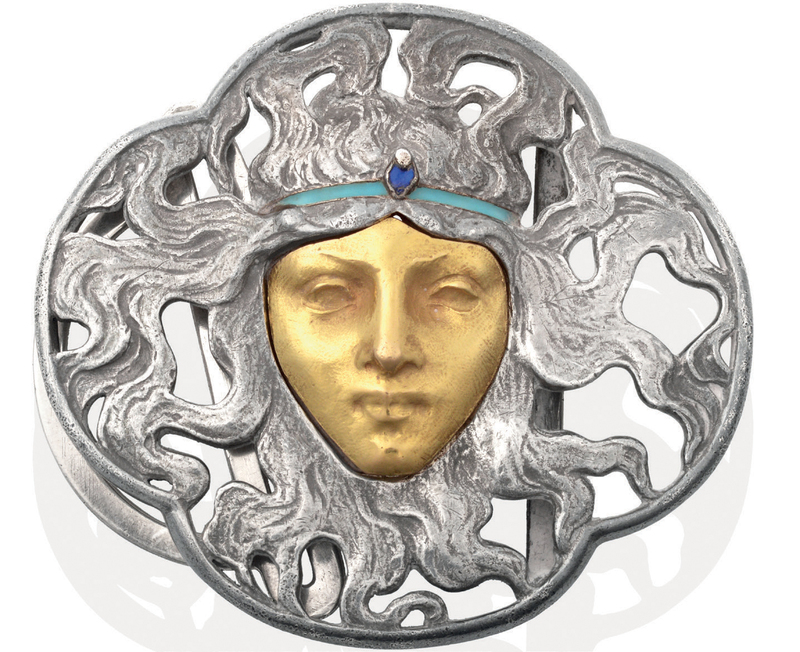 The Art Nouveau-style silver and gold buckle, measuring 2½ x 3in (7 x 7.5cm) was modelled in the form of a female face with flowing hair and a blue enamel headband. It had been estimated at £5000-8000 in Tennants’ (20% buyer’s premium) November 17 Fine Art Sale in Leyburn. It was featured on the BBC Antiques Roadshow filmed at Castle Howard (broadcast on April 22). The vendor had been gifted the buckle by her uncle’s great aunt, who had moved to the UK from France in the 1890s. Lalique began his working life as a jewellery designer and by the 1890s had set up his own workshop and become accomplished at incorporating enamel and increasingly glass into his work. “It was only in 1907, after he went into partnership with a perfumer to create beautiful perfume bottles that he made the transition to focusing solely on becoming a master glass maker,” added Tennants.